Lemongrass is used in Thai cooking and other Asian cuisines. It's a stalky plant that gives dishes a zesty lemon flavor and aroma. Learn how to buy it and prepare it to use in your recipes that call for lemongrass. You can find fresh lemongrass in most Asian food and grocery stores. It is usually located with the other fresh produce and is often sold in bundles of two or three stalks. 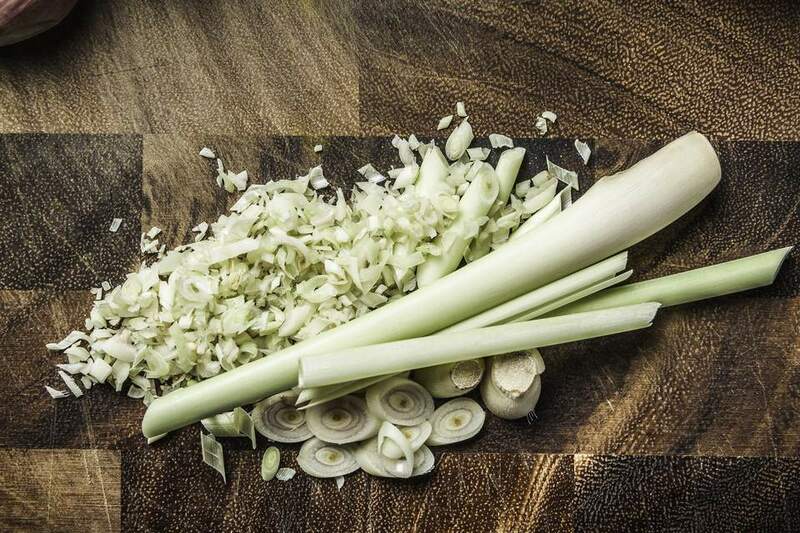 When buying fresh lemongrass, look for stalks that are fragrant, tightly formed, and of a lemony-green color on the lower stalk (near the bulb), then turning to a truer green at the end of the stalk. Avoid purchasing stalks that are loose and coming apart as well as stalks that are brown and crusty or crumbling. These are old and probably not that fragrant or nutritious any longer. If you can't find lemongrass with the fresh produce, check the freezer section. Because lemongrass freezes well, it is often sold in frozen packets of about six to eight stalks. To prepare lemongrass for cooking you need a sharp serrated knife, a cutting board, and a food processor or mortar and pestle. The softer, fleshier part of the lemongrass (which is what you want to use in your cooking) is located under the tough outer leaves. Peel away these layers with your fingers and discard them. What you will uncover is a pale yellow stalk that is softer and easier to slice. Use a sharp serrated knife to slice off the lower bulb. If you cut about 2 inches from the end, you should be able to remove the whole bulb, plus a little more. Discard the bulb. Now it should be fairly easy to cut up the lemongrass. Starting from the lower end (where the bulb was), make thin slices of up to two-thirds of the stalk. Stop slicing when you have cut two-thirds of the way up the stalk, or when it is no longer yellow and fleshy. The upper end the stalk will be mostly green and woody but is still useful in cooking soups and curries. Reserve this top end of the stalk for your recipe. Do the same for the other stalks, depending on how many stalks or tablespoons of prepared lemongrass the recipe calls for. (You can also choose to prepare all the stalks at once for use later). Because lemongrass is so firm and fibrous, it helps to process the slices a little further. Place the lemongrass in a food processor (or chopper) and process well on "high." Or, pound it for a minute or two with a pestle and mortar. It's possible to use the lemongrass slices as they are, but the thicker slices will be difficult to eat and your guests will end up spitting them out. Your lemongrass should now appear finer—almost like yellow-green flakes. It is now ready to use in recipes such as curries or soups. Note that the lemongrass still needs to be cooked or boiled for at least five minutes before it is soft enough to be edible. Use the lemongrass immediately, or store lemongrass by freezing it in a sealed container in your freezer. With lemongrass, very little is wasted. You can use the upper, reserved stalk to add even more flavor and fragrance to soups and curries. Simply make several superficial cuts along the length of the stalk with your serrated knife. Then, holding the lemongrass at either end, gently bend it several times to "bruise" it. This will release the fragrance and flavor. Now throw the stalk into your soup or curry pot. Be sure to warn guests the stalk is inedible. Use your processed lemongrass to create wonderful Thai soups, such as tom yum soup, or dishes including Thai green curry, Thai massaman chicken curry, and roasted lemongrass chicken.